Ekol is a fast-growing Turkey based company offering supply chain solutions and integrated logistics to local and foreign customers in numerous sectors. They provide logistics services for a number of well-known fashion brands. After a comprehensive study, Ekol’s management decided to automate the workflow in their fashion DC in Istanbul in order to be able to process higher volumes in a more efficient and cost-effective way. Ekol put out a request for tender and in November 2012, Equinox MHE was awarded the contract to supply the sorter installation and the shipping sorter including software & controls and peripheral systems. 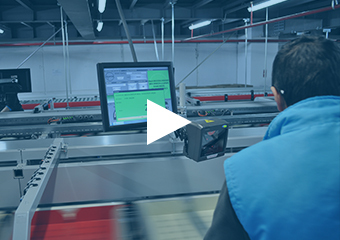 In September 2013 Ekol´s new sorting and shipping process went live. Clothing arrives in carton boxes at the two induction platforms (each with four positions) and is manually inducted in the trays of a twin tray Oval Sorter (aka bomb bay sorter) with 210 drop stations. Twin trays make it possible to put two flat garments together in one tray and have the products dropped into two separate destinations. For larger garments, both tray plates can be used. The barcode on the clothes is scanned by an automatic bar code reading system and the items are dropped into the corresponding carton. The sorter is engineered in such a way that cartons of different sizes can be used underneath the sorter. The cartons are provided via a carton erector that is able to erect different sizes of containers. Once the full lane sensors have detected that a carton is full, an operator pushes the carton onto the takeaway conveyor and puts an empty one in its place. The takeaway conveyor passes the full cartons along a platform with six operator positions. If the carton is of the right size for a random top taper, the operator labels the carton with a bar code and pushes the carton onto a conveyor that leads it to the taper. If the carton is too big for the random top taper, the operator closes the carton manually. All closed cartons then go on to the shipping sorter. Once near the shipping sorter, a bar code reading system identifies which lane of the cross belt sorter is appropriate on the basis of the label on the carton. In total there are 51 lanes and the cross belt sorter has a capacity of 3,000 cartons per hour. In Turkey, Equinox MHE works closely together with Lodamaster, a partner company that provides logistical solutions for Turkish companies like Ekol. The twin tray Oval Sorter offers Ekol a capacity of 12,000 trays per hour. The maximum weight of the products is 5 kg, minimum is 0.02 kg. The largest item Ekol can induct in the twin trays is 55 x 39 x 10 cm, the smallest is 5,5 x 9 x 1 cm.